Using local or native plants in your yard is an excellent way to spruce things up and attract local wildlife with very little maintenance. In this article, by Barmekin Groundcare – a firm of leading Aberdeen landscape gardeners you will find the reason why it’s best to have local plants in your garden, as well as some advice on how to make them thrive. Before we proceed with the benefits of having local plants, let’s answer one of the most important questions first:Why use native plants? Native plants require less maintenance because they have already evolved and adapted to a specific area, and would therefore do need very little to no watering, or require commercial fertilizers of pesticides. Most native plants will not usually need much raking, because the fallen leaves could serve as soil-builders and natural fertilizers, so you do not have to mow your lawn. Generally speaking, plants that are adapted to local climate will have more resistance to pests and diseases. Having native plants in your home will contribute to the overall health of your whole community, because they will help decrease and put a full stop to the harm done by invasive alien species. Native plants are resistant to pests, so you won’t need to spray any harmful pesticides for maintaining or improving soil condition. Landscaping with native plants will not only be beneficial to you, but also to the animals around you. A healthy ecosystem is created if you plant with native species because they provide great sources of food and shelter for birds, butterflies, and other wildlife. Native plants also give out a distinctive style in a certain area–so you will have sort of like a regional character that makes your area unique. Native landscaping also reduces environmental threats. Not having to use a lawnmower or a leaf blower in clearing out your yard means that you won’t consume any electricity or gasoline. Maintenance equipment such as these are normally associated with emissions of different air pollutants (carbon dioxide, carbon monoxide, sulfur oxide, etc. ), so not using them will lessen the release of harmful air toxins. By following these steps, you will be closer to achieving a healthy and environment-friendly garden that won’t require much fertilizers and complicated watering systems. Once you already have an idea of the possibilities offered for plant life in your area, and what you’d like to get out of them, then you will be ready to get out there and pick out your plants for your garden! 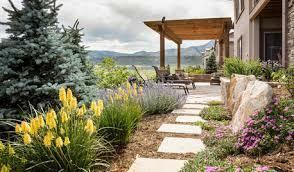 Landscaping Style – What Appeals to You?